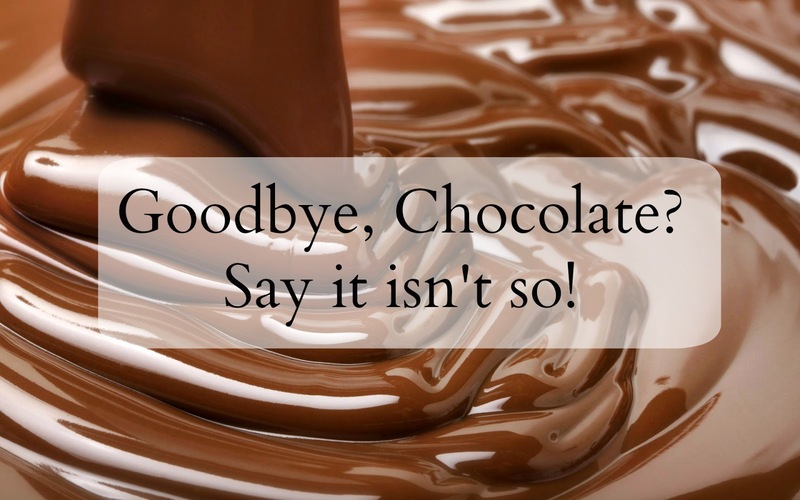 Chatting Over Chocolate: BREAKING NEWS: No More Chocolate by the End of 2015! BREAKING NEWS: No More Chocolate by the End of 2015! Could this be our LAST Easter enjoying Cadbury Eggs and Reese's Peanut Butter Eggs?! I'm heading to the store immediately to stock up on my favorite, Hershey's Nuggets with Toffee & Almonds, and will likely grab one of everything while there! I can't imagine a world without chocolate! I hope I make it before the shelves are bare!!! What will be on your April 1st shopping list? I am sure hoping this is an April Fools joke! ;) A world without chocolate is not one I would want to live in! OMG. If this were for real I would STOCKING up. I couldn't survive without chocolate! lol. That is why I got my Easter candy yesterday =) I'm ready for the end of chocolate now ! Are you sure the shortage isn't due to my pregnant self eating all the chocolate? ;) This would be terrible if it actually happened! This would be the worst news ever if this was for real! I don't know what I'd do - I'd need to create quite a little stash at home! April Fool's jokes... they get me EVERY TIME! Ha ha! Ok when I saw the title of this post, I almost thought you were going to stop blogging :-p I didn't even think real chocolate. Ha! I fell for it. I was getting ready to go buy all of the Reese's peanut butter eggs.